Heat broccoli mixture, mushrooms, onion, broth, marjoram, pepper and noodles to boiling in 10-inch skillet; reduce heat. Cover and simmer about 8 minutes, stirring occasionally, until noodles and vegetables are tender. Stir in chicken. Mix sour cream, water and flour; stir into chicken mixture. Heat to boiling. Boil and stir 1 minute. 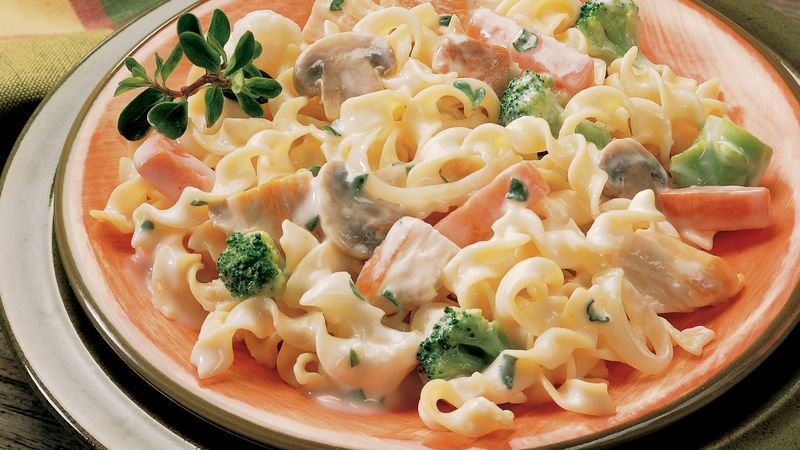 You may use any frozen vegetable combination that your family likes when preparing this stroganoff. If you're not familiar with it, marjoram has a mild, sweet, oregano-like flavor. In fact, wild marjoram is another name for oregano!